These cookies are my favorite so far! Kinda messy to make with the red dye, but so worth it! 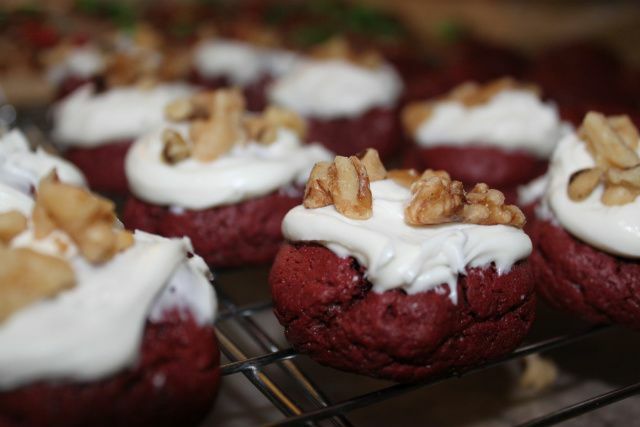 Betty Crocker Red Velvet cookies. Heat oven to 375°F. In large bowl, stir cookie mix, cocoa, butter, sour cream, food color and egg until soft dough forms. Bake 8 to 9 minutes or until set. Cool 2 minutes; remove from cookie sheet to wire rack. Cool completely, about 15 minutes. Frost cooled cookies with frosting. Sprinkle with nuts. Store tightly covered at room temperature. Check back later today! Cookie #5 posts at 4:00pm. Ohhh....they look so good! I love cream cheese icing! My favorite! I will have to try these! Red Velvet cake/cupcakes are my absolute favorites. I'd be willing to bet these are equally as amazing. Drool. 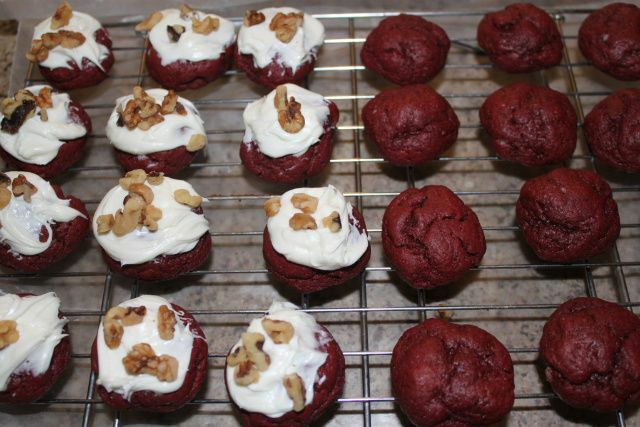 I am stealing that recipe - red velvet cupcakes are my fav!!! nom nom Those Kisses cookies are my fave too!I have never had red velvet. I'll have to give it a shot. I am trying to make Ricotta Cheese cookies tomorrow as my new addition this year!